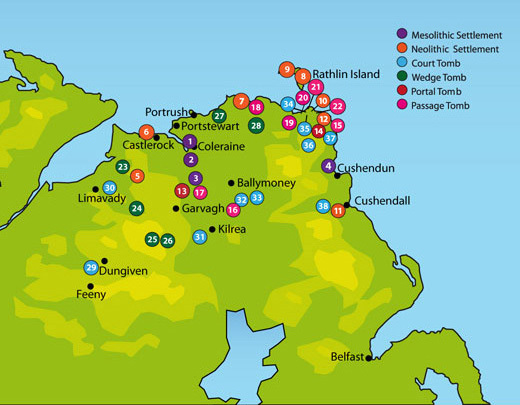 The majority of the information on this map is taken from the Environment and Heritage Service of Northern Ireland Sites and Monuments Database. A hot link to more detailed information available on the database has been provided for each site (SMR No), as well as an Irish Grid Reference to locate the site on an OS map. Site of the earliest known human settlement in Ireland, dating to 7900-7600BC. Peter Woodman also found evidence of Early Mesolithic occupation here. Only 2km away from Mountsandel, it is possible that these settlements were only part of a larger community settled over a broad area of the Bann estuary that shrank or expanded as the seasons permitted. During the construction of the marina, a large number of flints were unearthed from the river bank and the river itself, indicating a late Mesolithic settlement site. The flints are now held by Ballymoney Museum. The late 13th or early 14th century tower house stands on a rocky outcrop overlooking Cushendun Bay and the remains of a Late Mesolithic flint - working site. Excavation of a prehistoric earth and stone mound unearthed two stone Neolithic hearths, decorated pottery and worked flints, as well as some Mesolithic Bann Flakes and sherds of Bronze Age Beaker pottery. A prehistoric sandhills settlement was found during the removal of sand in dunes on Castlerock golfcourse. Neolithic & Early Bronze Age flints & pottery were recovered from the disturbed sand. The foundations of numerous Neolithic huts, extending for a quarter of a mile, were found here in 1897. The settlement shows evidence of larger communities coming together during the summer to use the rich deposits of flint. Finds included over 500 flints in various stages of manufacture, and numerous fragments of urns. Excavation in the garden of a house discovered the remains of a Neolithic settlement. Some of the finest pottery remains found in Ireland were retrieved, as well as flint and porcellanite tools, a pebble macehead and a shell midden. Evidence for Bronze Age and Early Christian activity was also found. At Brockley, porcellanite rock was mined to make polished stone axe heads. These valuable tools were traded by Neolithic people across Ireland and the British Isles. Flint blocks were extracted from the cliffs here for making tools. During excavation of an extensive settlement of medieval booley houses, Neolithic pits were found filled with pottery sherds and nodules of flint, in some cases broken and re-assembled. This practice has been associated with a fertility ritual, where people returned the natural resources which they used back to the earth. 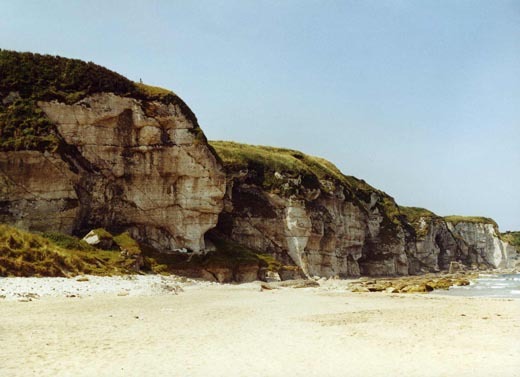 This is the only place apart from Brockley, Rathlin Island where porcellanite rock was mined by Neolithic craftsmen. Only roughouts of axe heads were found, suggesting that the grinding and polishing of axes was done elsewhere. Several Neolithic hearths and a cobbled area were uncovered, along with a quantity of struck flint, pottery and fragments of porcellanite. No traces of structures were uncovered. This portal tomb has been greatly disturbed with two of the original six pillar stones removed. The capstone, now collapsed, is one of the heaviest in the north, weighing about 50-60 tonnes. There are three portal tombs, one passage tomb and a wedge tomb within this one townland, and evidence has also been found of a Neolithic occupation site. 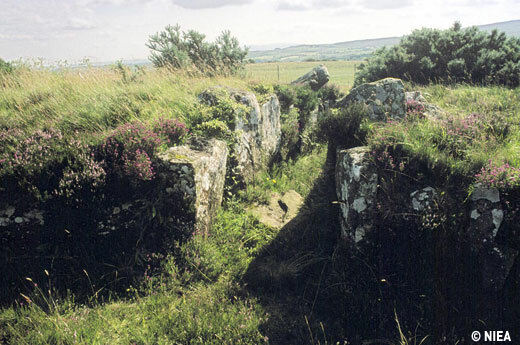 The remains of the cairn is about 5ft high, and the slabs of the chamber roof are partially exposed. Despite its name, Craigs Dolmen is a passage not a portal tomb. Removal of the earth covering in the 19th century destroyed much of the evidence for archaeologists. It has several standing stones supporting a large capstone and a burial urn was found inside. A similar passage tomb to Craigs Dolmen, it has several standing stones supporting a large capstone, surrounded by a low, roughly circular cairn with trees growing on it. Passage tombs are often found in groups like these, which have stunning views over Whitepark Bay. 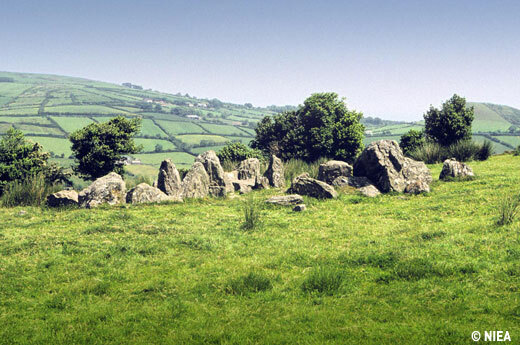 Grave goods, human remains and traces of other Neolithic activity have been found in each, as well as evidence of earlier settlement on the site of the Druid’s Stone. There are stunning views from this passage tomb on the summit of the hill. There is no sign of any uprights, but the cairn appears intact. Dramatically sited on cliff-top with good views. The stone kerb of a passage tomb cairn is still visible, as well as the remains of a court tomb 30m away. The remains of this passage tomb are situated on a plateau overlooking Rathlin Island. On top of a steep hill with good views of the cairn kerb and burial chamber of a passage tomb can still be seen, though there are no traces of the ‘ruins of other enclosures’ adjoining the tomb recorded in the Ordnance Survey Memoirs. An excavation during the 1930s found three chambers. The second chamber contained the remains of at least 6 adults, a child around 12 years old and an infant. Sherds of Beaker pottery and a flint scraper were also found. The tomb now sits in a crater formed by quarry spoil, leaving it 4m below the surrounding quarry. It was excavated in 1937 and finds included sherds of Late Neolithic pottery, worked flints including scrapers, hollow scarpers, knives, a Bronze Age barbed-and-tanged arrowhead, a leaf - shaped arrowhead and small fragments of human bones scattered through the chambers, representing at least 2 skeletons, one male and the other probably female. This tomb is set on a level terrace with excellent views over the Roe Valley to the south. Excavated finds included the cremated bones of an adult, possibly female, several flint flakes, scrapers, knives, a barbed-and-tanged arrowhead, a schist axe head and several sherds of pottery, mostly Late Neolithic, with one Bronze age sherd. In a large field with good views over the Glenshane Valley. On a very slight rise with good views is a wedge tomb known as Gigmagog’s Grave. Set near the field boundary, it features a gallery with capstones and enclosing cairn. Situated in flattish land pasture with sight of Knocklayd, the cairn is quite intact. Some traces of the kerb of a cairn survives and internally the tomb is divided into two chambers, with double jamb stones dividing them. This impressive court tomb was excavated in 1940, revealing an antechamber and 2 chambers, late Neolithic decorated bowls, flint tools, and a cremation. The first chamber is visible and accessible. Situated on Long Mountain, the Broad Stone is often mistaken for a portal tomb because of its cap stone, which was actually placed there by local people in the 19th century. Treasure hunters had previously damaged the tomb in a misguided search for precious artefacts. 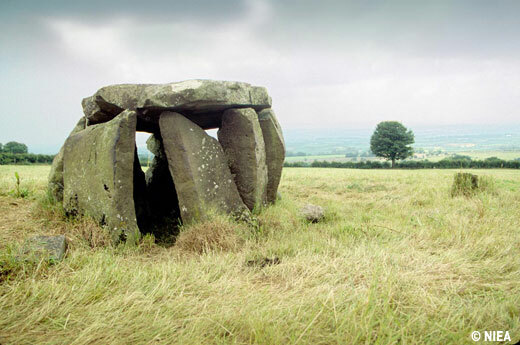 Known as ‘Dooey’s Cairn’ this is one of the best preserved court tombs in Ulster and believed to be used as a ritual burial site 3,000 years ago. 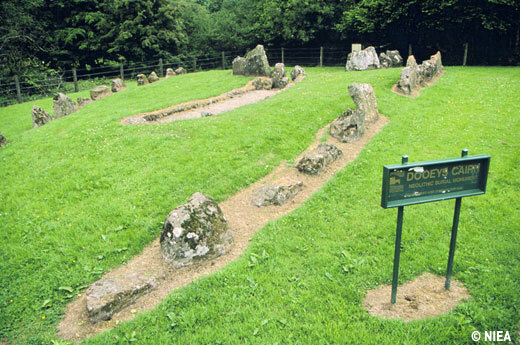 Uniquely, it has a long trench beyond the stone forecourt, believed to have been covered by a timber platform on which cremations occurred 500 years before the forecourt was built. The trench contained the remains of 5 or 6 individuals, more than usually found at a court tomb. At the base of a steep basalt ridge, on ground sloping down steeply to the west. There is now no evidence of the cairn, though traces were noted in 1940. The court tomb is located on Fair Head with panoramic views over the coastline. 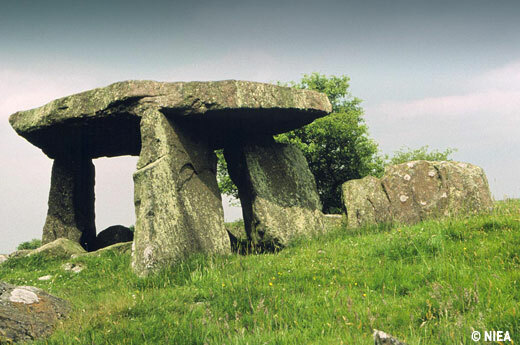 Nearby are the remains of a wedge tomb. Sat within a small clearing in Ballypatrick forest, is the remains of a dual court tomb. Although no visible trace of the cairn now survives, the chambers can still be seen. Situated on a ridge top south of Loughareema. The cairn is virtually intact, so the gallery is not visible. Named after the much later Early Medieval warrior poet, and commanding spectacular views of the coast near Cushendall. The site comprises a series of upright stone with no cairn.